Elder's rifle is a hybrid indicator which automates market analysis using the Elder's Triple Screen system. The indicator analyzes twenty currency pairs using the Elder's Triple Screen system. The indicator is automatically expanded if more than four pairs are added. The maximum number of pairs is 20. The analysis is performed on four combinations of price ranges (Mn-W1-D1, W1-D1-H4, D1-H4-H1, H4-H1-M15). Switch range combinations using blue up/down arrows. The indicator will send an alert with recommendations in case of a buy or a sell signal for any combination of ranges. You can enable/disable alerts for different range combinations. For example, you can make messages arrive only for D1-H4-H1. Instrument_1 = "EURUSD"; - Select trading instrument. Instrument_2 = "GBPUSD"; - Select trading instrument. Instrument_3 = "USDCHF"; - Select trading instrument. Instrument_4 = "USDJPY"; - Select trading instrument. Instrument_5 = "USDCAD"; - Select trading instrument. Instrument_6 = "AUDUSD"; - Select trading instrument. .... and so on up to the 20 th instrument. Price_MACD_EMA - Determine the indicator's readings by the current and the previous bar (Current Price) or by the last closing and the closing before the last one (Close Price) for MACD and EMA. Price_ST_1_ST_2 - Determine the indicator's readings by the current and the previous bar (Current Price) or by the last closing and the closing before the last one (Close Price) for Stochastic. up_signal_color - Buy light color. down_signal_color - Sell light color. TimeFrames - Select a combination of ranges by default (Mn-W1-D1, W1-D1-H4, D1-H4-H1, H4-H1-M15). Alerts - Enable (true)/Disable (false) alerts. Alert_Interval = 5; - alert interval in minutes. MN_Wk_D1 - enable/disable alerts for this range combination. Wk_D1_H4 - enable/disable alerts for this range combination. D1_H4_H1 - enable/disable alerts for this range combination. H4_H1_M15 - enable/disable alerts for this range combination. Also, there are the settings for all indicators included into the hybrid: MACD, EMA and Stochastic. This allows you to set the system algorithm the way you like. The standard settings used in the classic Elder system are specified by default. A preliminary buy signal appears when the first, the second and the third lights are green. It means we should be ready to buy. A preliminary sell signal appears when the first, the second and the third lights are red. It means we should be ready to sell. The Elder's system recommends to open a buy position when the first, the second and the fourth lights are green. 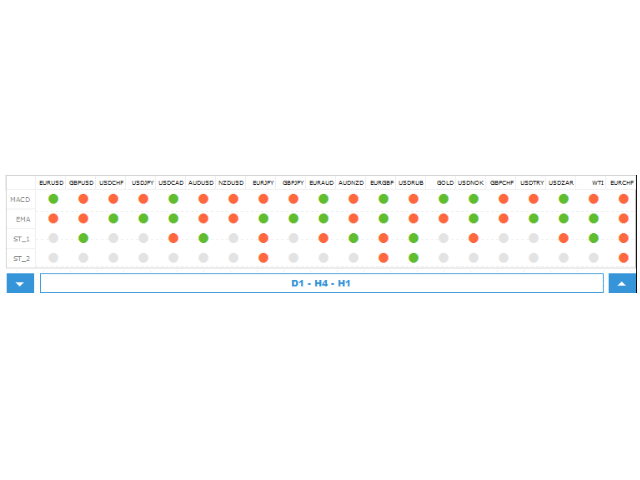 A sell position is opened when the first, the second and the fourth lights are red. Однозначно 5+ отличный продукт РЕКОМЕНДУЮ!!! Но есть один маленький ньюанс но очень весомый для меня ) ОГРОМНАЯ просьба доработайте пожалуйста алерт виде уведомления на терминал в мобильном телефоне, нет возможности постоянно находится возле компьютера. Ну и в заключении Спасибо за предоставленный продукт!!! До покупки индикатора требовалось много времени чтобы посмотреть 3 экрана,из- за чего пропускал много сделок на вход/выход. После приобретения- количество сделок и их качество увеличилось в разы! Огромное спасибо разработчику! Andrei provides great help and support!! I just talked 25 minutes with him on Skype and he gave me some very useful inputs. Great indicator. Indicator is based on sound trading principles. It saves a lot of work analyzing multiple pairs to trade instruments based on Elder's Triple Screen system, therefore increasing trading opportunities.My results so far have been very positive. I had a few questions regarding the indicator and the author was very responsive and provided very detailed explanation and clarification on the functioning of the indicators.